Caine Riordan has a habit of being in the wrong place at the wrong time. In ‘Fire With Fire’, he stumbled into an intergalactic conspiracy. As a result, he lost thirteen years of his life and suffered a change in profession from writer to soldier, spy and sometime diplomat. In ‘Trial By Fire’, he is retired, reinstated and promoted so many times it’s dizzying, all in an effort to keep apace of the action. An exosapien disagreement is playing out in Indonesia, after all. 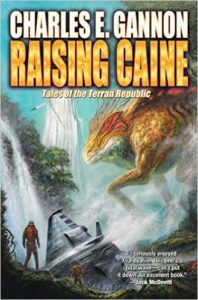 By the time ‘Raising Caine’ opens, Riordan is a leaf on the wind. The invasion of Earth has just been quelled and already Riordan is being offered a new mission. The mysterious Slaasriithi would like him to visit their worlds. Friendship with the Slaasriithi is an almost necessary venture as the Consolidated Terran Republic is sadly lacking in allies among the other sentient species in the galaxy. Riordan’s journey is nearly over before it begins due to security issues, possible sabotage and actual stupidity. Once in Slaasriithi space, the problems continue, a good number of them simply due the absolute alienness of their hosts and the bizarre and dangerous life-forms on their planet. All of this and a group of renegade K’tor are hell bent on stopping this alliance. As with all the books in this series, the action begins on the first page and backstory is revealed in the first few chapters. Reading the preceding novels will give you a better and deeper appreciation of the greater story, though, particularly in regards to Caine Riordan. He’s an agreeable character and entertaining to spend time with. My favourite aspects of this third novel in the series are numerous. The first is the readability. The fact the story picks up right where it left off and continues on, unabated. Charles Gannon simply assumes his readers will keep up and I prefer this to being spoon-fed extraneous detail. That’s not to say there isn’t a lot of detail, however. There’s tonnes, which is another favourite aspect. If you like military Science Fiction, you should be reading this series! I happened to be listening to ‘Master And Commander’ on audio around the same time and I couldn’t help comparing the approach of both authors to the inner workings of naval culture and discipline and the dedicated delight with which they describe it. In ‘Raising Caine’, this same care is shown in revealing the absolute strangeness of the Slaasriithi. Throughout this series, I’ve been in awe of Gannon’s imagination when it comes to alien species. I’ve also enjoyed the surprise of a few. The Slaasriithi take the proverbial cake, however. They’re just so weird but very, very cool with all their sub-species and genetic specialisations. The use of pheromones or markers is really unique. While Riordan might not have enjoyed his time on the Slaasriithi planet, I certainly did. There is a scene with a creature called a water strider that is very touching and very revealing of Riordan’s character, too. The differences between human and Slaasriithi are examined in detail during several exchanges before, during and after Riordan’s excursion to Slaasriithi space and these are another example of Gannon’s ability to disparate species. I also enjoyed gaining a deeper sense of who the K’tor are and the glimpse into their very non-human culture and disdain for humans. Finally, I loved the point of this book. The reason for the plot and adventures along the way and why the Slaasriithi wanted Riordan to visit and what they really wanted from him. It was another great example of Riordan being in the wrong place at the wrong time or maybe it would be better to say he has a habit of being in just the right place at the right time. Guess I’ll just have to wait until next year. In the meantime, Gannon has a lot of extras on his website including short stories and author and character interviews. Definitely worth checking out. « Warm Bodies by Isaac Marion (book review).